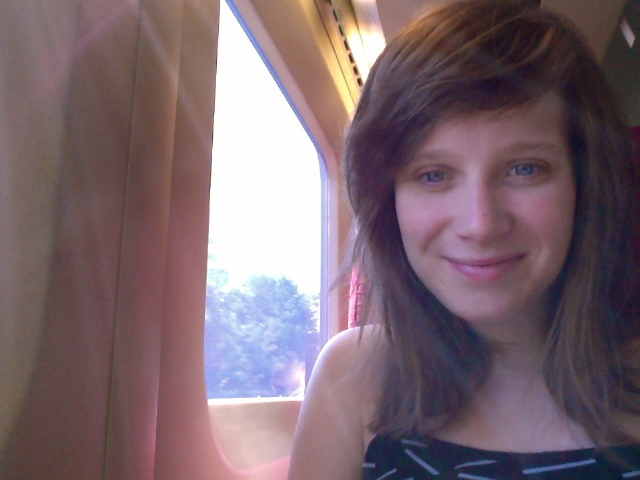 I’m so happy to welcome Hannah MacDonald to the blog as a guest writer. This is the first in a series she’ll be writing about her move “Out West”. “One way to Edmonton?” the clerk at the VIA Rail ticket counter asked. “Yes…” I replied with surprise. I glanced back at my dad with a look of confusion, realization and love. A quick quip from him and before I knew it, Mom, Dad and I were shuffling my bike into its boxed home for the train trip. Although that small confirmation question jolted me into reality, I still have not wholly realized that I’m leaving and, in fact, that I’ve already left. I’ve said goodbyes to my friends at Governor’s Pub over clever and talented music. I’ve hugged family members over hors d’oeuvres on the front lawn of our Margaree homestead. My co-workers traded me souvenirs for my best or juiciest stories from my stint there. I even went swimming in the ocean in early July to get that fine Atlantic salty hairstyle – an act I never dared until August when the ocean’s warm enough. 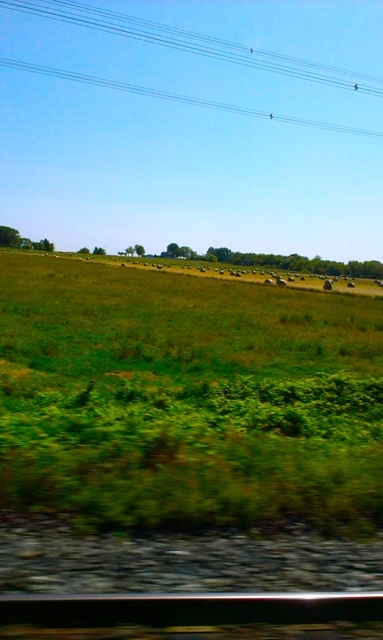 As the train follows the St. Laurence upstream, it still feels as though I’m on vacation. A short trip away from Cape Breton to visit friends who’ve moved west. Now, I’m that friend. Moving west. Moving to Edmonton, Alberta. How cliché. Ever since my partner and I decided to move to the prairies, I’ve been dealing with the idea of leaving Cape Breton, the logistics of moving to a new city and a feeling of personal-responsibility-island-guilt-preemptive-homesickness, if you will. My concern is that I’m abandoning the island and the people I love so much. Fortunately, I’ve found consolation and comfort in these same places. Friend Insurance: I was overwhelmed by appreciation and love of my friends and family as we gathered at my childhood home on the Mira for my goodbye party. 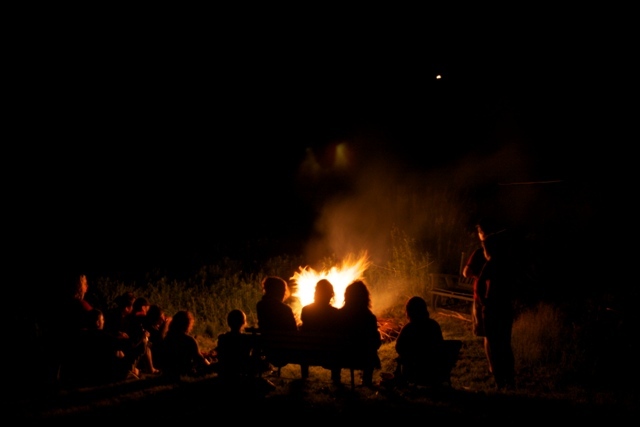 Around the bonfire, there was nothing but laughter, stories and pure summer goodness. In the warmth of the evening, I was lamenting leaving this beautiful place. My clever friend said, “Don’t worry, Hannah, this is friend insurance. You’ll be back.” It’s true. Brilliant, they are. My friends have ensured that I left with wonderful memories of home and insured my return. Island Attitudes: Before leaving, a lovely friend asked me to host the IDEAS! Powered By Passion Youth speakers evening. My initial reaction was, “No! I shouldn’t host an evening stimulating momentum when I won’t be around to take part. It just seems wrong” She encouraged me to reconsider, as my move is part of a larger Cape Breton reality. People leave, people stay, people come home. We shouldn’t feel we’re abandoning our island by leaving – going ‘away’ and coming home brings new and fresh ideas for our island’s benefit and growth. 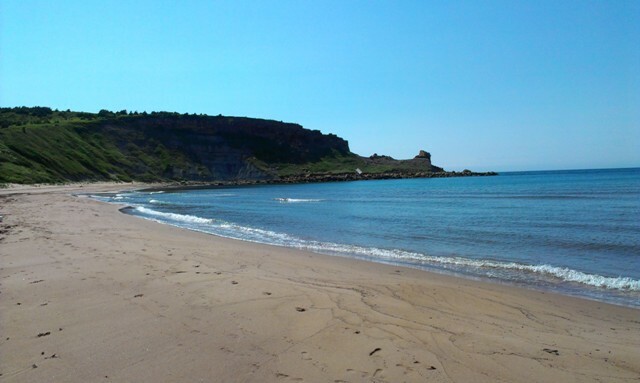 When people move to Cape Breton, it shouldn’t be questioned or surprising – it should be applauded and encouraged. A shift in attitudes is needed. My own included. And I think we’re headed in the right direction. *Note: watch out for the YouTube videos of the Youth talk from New Dawn’s website. Well worth a watch! Living in the Year 2012: Walking home to the North End, a wise friend reminded me that being away doesn’t mean being disconnected. “The only difference between being here and away means you just won’t get to have that cup of tea.” In the modern age, community development can happen in person and online. So long as you’re personally invested in a place, your input can still have weight, even from 5,000 kilometres away. From these and the many other conversations I’ve had with folks at home, I feel better about going. Even “coming from away”, I’ve got big dreams for Cape Breton. Where better than to reflect on this than Leah Noble’s blog-turned-community Dream Big, Cape Breton? I’ve never written publicly nor electronically. Another change, with hope that it’s for the best. I’ll be contributing on a (bi-)monthly basis from Canada’s most northerly city. I hope to provide some clever anecdotes from life in Alberta and how their ‘Celtic music’ nights compare. Mostly, I aim to reflect on the strength of the Cape Breton connection from six provinces away. For now, cheers from kilometre 1,763! This entry was posted in Guest posts, Women + kids and tagged Hannah MacDonald, Margaree, Moving west, trains. Bookmark the permalink. Wow! When I saw Becca’s post about you’re going out West. I thought it was for a conference or something, not until Leah’s blog did I realize the difference……I am sorry, Hannah, that time and circumstance prevented us from knowing each other better……but I have followed your career somewhat via the CB Post, and knowing your roots, I can’t think of a better Cape Breton ambassador to the West! Your parents and I and our generation (hippies!!) set out to change the world, but met with limited success….I have absolutely no doubt that you, Becca, and Carrie will do more than just pick up where we left off, you already have!! I wish you all the best for the future….. Thanks so much, Ken! I so appreciate your comments! I hope we (the three sisters!) will keep up the work. It’s strange but interesting being out here. I’ve arrived safe and sound and will keep sending (hopefully) intriguing tidbits back with the DBCB blog. It’s a new adventure, but my Cape Breton roots will keep me grounding, I’m sure. I hope you’re having a beautiful CB summer. Thanks again! Good luck Hannah. I’ve been away from CB for awhile, but it is still home and I still feel deeply connected. Being away, there are still lots of ways to contribute to life on the island. You will do great things wherever you end up. Thanks so much, Natalie! I’m glad to hear the connection to Cape Breton stays even while away. You seemed to have done a lovely job of keeping connected and doing super interesting things wherever you are.